The best place ever to be!!! The best family time !!! We enjoyed Garza Blanca every time!!! It was my and my boyfriend who traveled to this resort together and we LOVED it!! We loved the views, food and facilities, we swam in all the pools. The swim up bar was a fun day activity and the bar on the roof was beautiful and great for the sunset. Staff was wonderful to us the entire time, so helpful and kind. Only thing that was strange and not really a complaint but unexpected— during our check in, we had to pay more if we wanted to switch rooms, we were placed on the bottom floor which turned out it didn’t bother us too much, but it did not seem right we could not move to another level (even 3rd or 5th floor) for the same room layout. It does cost more to stay on the 8th/9th floor but we didn’t want to do that. We obviously still enjoyed our room, it was beautiful with a balcony. Otherwise perfect stay and experience. We will definitely be back!! Where to find El Tuito hotels near an airport? Where can I find hotels in El Tuito that are near tourist attractions? Expedia has no hotels listed within El Tuito, however, we have 4 accommodation options that are within a 20-30 minute drive. The closest Expedia-listed hotel is the Garza Blanca Residences All Inclusive, Jalisco, which is 19 kilometres (12 miles) from the heart of El Tuito. As an alternative, you could check out the Casa de Las Palapas Private Estate, located in Jalisco, which is 20 kilometres (14 miles) away. 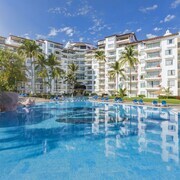 You could check out the Secrets Vallarta Bay Puerto Vallarta - All Inclusive as well as the Now Amber Puerto Vallarta Resort & Spa - All Inclusive. 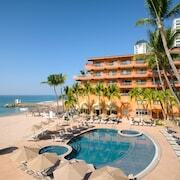 The Secrets Vallarta Bay Puerto Vallarta - All Inclusive is positioned 30 kilometres (18 miles) from downtown El Tuito. 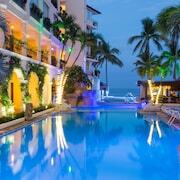 The Now Amber Puerto Vallarta Resort & Spa - All Inclusive, is situated 30 kilometres (18 miles) away. 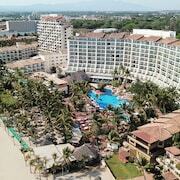 Another possibility is to make a reservation at the Hotel Playa Fiesta or the Resorts by Pinnacle 180. Consider spending some time visiting Galeria Pacifico and The Church of Our Lady of the Refuge, in Downtown Puerto Vallarta, 25 kilometres (16 miles) to the north of El Tuito. Should you wish to spend a night or two in Downtown Puerto Vallarta, check out the room rates at the Villa Premiere Boutique Hotel & Romantic Getaway and Hilton Puerto Vallarta Resort All Inclusive. 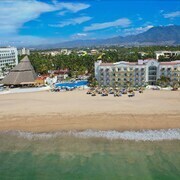 30 kilometres (18 miles) to the north of El Tuito, you'll also find South Hotel Zone, which is home to the Casa Velas Luxury Boutique for Adults Only - All Inclusive and Velas Vallarta Suites Resort All Inclusive. The Uno and Galeria Flores are popular attractions to check out when you're in South Hotel Zone. Before you say goodbye to Puerto Vallarta, why not make sure you catch some local sport. Visit La Paloma Plaza de Toros to the north of El Tuito. For tourists who are interested in staying close by, make a reservation in the Meliá Puerto Vallarta All Inclusive or Sunset Plaza Beach Resort & Spa Pto Vallarta All Inclusive. 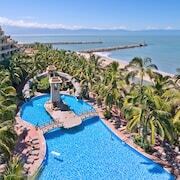 If you are planning on arriving or departing through Licenciado Gustavo Diaz Ordaz International Airport, you may like to stay at Canto Del Sol Plaza Vallarta All Inclusive, or Villa del Palmar Beach Resort and Spa, Puerto Vallarta, which are both a short ride away. 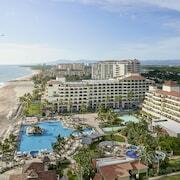 What are the most popular El Tuito hotels? Are there hotels in other cities near El Tuito? 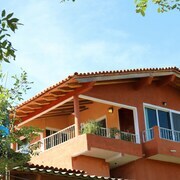 What other types of accommodations are available in El Tuito? Explore El Tuito with Expedia.ca’s Travel Guides to find the best flights, cars, holiday packages and more!